Uglyworld #226 - Presents for Mireille, originally uploaded by www.bazpics.com. Wage, Jeero and Wedgehead asked me if they could organise some presents for Mireille from the xmas market in Freiburg. I wasn't sure what they would pick up (and whether it would end up being cookies which they would eat themselves), but they did well - they found a stall with loads of Italian specialities for sale. 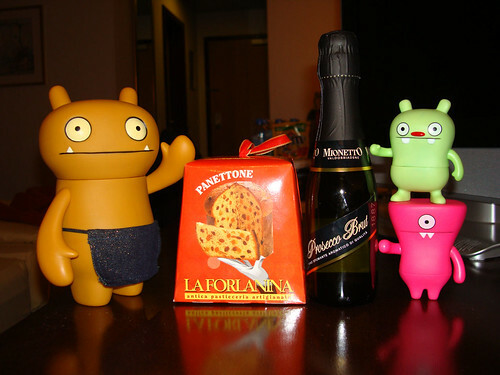 As Wage is off alcohol at the moment he organised a special box of cake for Mireille, while Jeero and Wedgehead sorted out a drink of the alcoholic variety.